Griddling isn't just done indoors anymore! Cook Your Meals Outside! Work at home mom, stepmom, trophy wife, blogger and loving life New England! Griddling Isn’t Just Done Indoors Anymore! Spring has finally sprung here in New England and that means that everyone is getting themselves outside as much as possible. Seriously, we only have a few months of warm weather here, so we all have to make the most of it. One of the things that makes me happy in particular once the weather gets nice is cooking out. Cooking and sharing a meal outside with my family makes my heart happy. But this year we are trying something a little bit different. Griddling outdoors (in addition to grilling of course). Outdoor griddling goes beyond the “same old, same old.” Anything that can be cooked on a typical grill can be cooked on a griddle – along with thousands of other foods. How do I bring my family together over an outdoor griddle you ask? The answer is my new Blackstone 28” Griddle! As you can see, it is shipped in a box, so some assembly is required. It took my hubby, Christian, less than 20 minutes to put it together. You will need a propane tank to fire this baby up and one battery for the igniter, neither of which are included. We just pulled the propane tank off of our grill. You, too, can discover the joys of Griddle Cooking with the Blackstone 28″ Griddle. It’s perfect for cooking for small or large groups, in your backyard or at your favorite campsite. The Griddle is evenly heated thanks to the H-Burner design, stainless steel tube. With perfect distance under the griddle and engineered spacing between burners, the result is a uniform heat across the surface. This creates a optimal cooking surface. 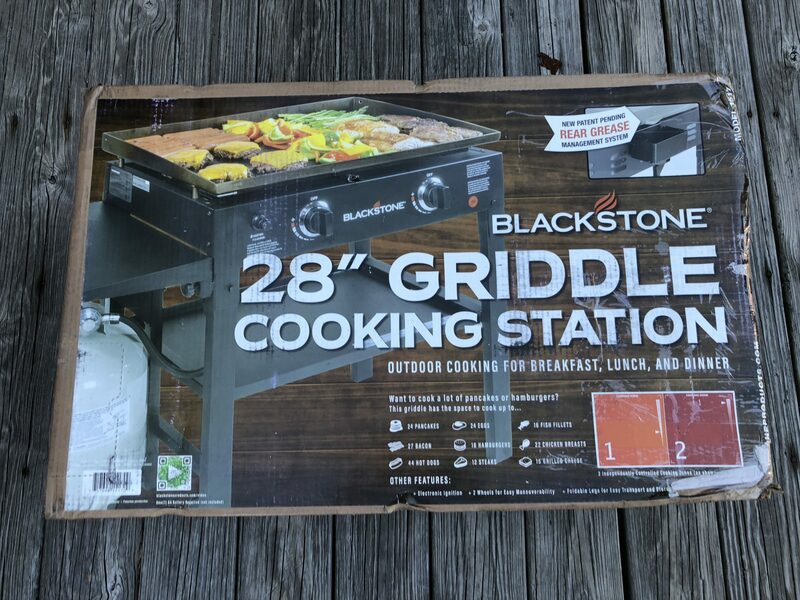 The legs to the Blackstone 28″ Griddle can be folded up allowing for easy transport, so you could even pack it up and bring it to tailgate at the Pats games this coming fall! Blackstone Products is THE expert in outdoor griddles. By combining the latest technology with innovation, Blackstone griddles take families from breakfast to lunch to dinner with desserts and snacks in between. Foods that could never be cooked on a traditional grill can now be cooked outdoors including eggs, pancakes, bacon, stir fry, cheesesteaks, even delicate fish. Griddling is easy to learn and, even more importantly, easy to clean. The transportable Blackstone griddles are perfect for tailgating, camping, parties with friends and even those with limited outdoor space. We are really loving our new Blackstone Griddle. We’ve been making just about anything and everything outside these days and I am looking forward to a summer full of memories around the griddle this year. Now this is a griddle that I can get down with! I would love to make my breakfast outdoors on something like this, what a great idea!! Now that is one nice thing to have in the backyard or back porch. It’s great to use when you have people coming over and you have to do a lot of “griddling”. I have been wanting to get one of these flattop outdoor cooking services for couple years now. We just looked at them again over the weekend. We love to cook outside too! This is pretty cool. I had not seen one of these before this. I’ve seen grills similar to this before but never a griddle. This would be great for cookouts as well as tailgating. It is great to be able to cook more than meat outside now. I will look into getting one of these for my husband. We love grilling out as soon as the weather gets warm. We have a huge back yard and patio and having a family get together at home is my fav part. This is such an awesome idea! What a great thing to be able to do when the sun is out and shinning – there is nothing like being out in the garden. My husband loves to grill outside but since we all went vegetarian and vegan we don’t eat meat. I love that this griddle can cook anything like pancakes, eggs and anything else you would use a frying pan for. My husband loves to griddle for breakfast. This would be a great gift for him, as he would love to do his thing outdoors. OH MY GOODNESS. Get out of here. I love my griddle but I need a new one, and this is a game changer. I need one of these asap! My husband is going to love this! Now he can cook outdoors for breakfast, lunch, and dinner. I love, it too! I like that this griddle doesn’t take long at all to put together. This could possibly be a new outdoor thing for us to do over the warmer months. My husband would love this! He loved to grill outside and all summer long we do meals outside all of the time. But we do not have a griddle to do that. Thanks for letting me know about it! I think we may need to griddle this summer! It looks portable enough for camping too! This would be perfect for my family. I love that we would be able to have a really nice hot bunch on the patio. Can we use this for camping? I like to think we can! This will add another dimension to outdoor cooking this summer. The size of that griddle would be perfect for our family of five! It would take breakfast for dinner to the next level for sure. Oh, that would be handy to take camping. While getting it there and back would not be fun, I can see it being used the whole weekend. Oh my gosh! I can see so many tailgating possibilities! We love cooking breakfast outdoors, but it is messy and difficult. This just took all the hard out of outdoor cooking! Okay, I need this in my life! That is really awesome. I want to have it for summer season, on the back deck to make up our breakfast. Would be totally awesome! That’s an awesome griddle. I could see hosting many family breakfasts if we had that at our house. There’s so much that you can do with that which is awesome! And I’m sure everyone’s looking forward to it as well. Perfect for parties held in the backyard during summer. Oh wow, this would totally make it worth cooking outside more during those hot summer months. Then I wouldn’t heat up the kitchen. This sounds really awesome!! I am seeing a lot of memories with this griddle this summer! Wow this looks amazing! My Dad would love this for father’s day! He always cooking up breakfast! I am honestly hearing about griddling for the first time, we would always grill in our home but we have never griddled and this seems like a whole lot of fun! Think about all the food that you can cook using this! It’s definitely perfect for the season and a must have if you love having guests over for a bbq! Work at home mom, stepmom, trophy wife, blogger and loving life in New England!